Margarita is an island surrounded by beautiful diverse beaches and scenery. The most beautiful part and the sunny side of Margarita Island is the hilly landscape in the east and north, specially in it’s fruity and tropical valleys. 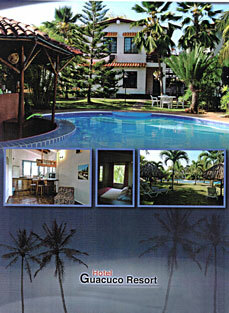 Here, between the "Cerro Matasiete" and the sea you’ll find our tropical oasis, The Hotel Guacuco Resort. Enjoy the 5000 m² tropical establishment with the exotic richness of it’s botanical garden with orchids, bromeliads, parrots and colibris, as well as the well cared pool area, tastefully styled with in every detail by the owners. Only 10 min far away of Sambil and 1 min to the beach, all of our apartments offer DIRECT TV.